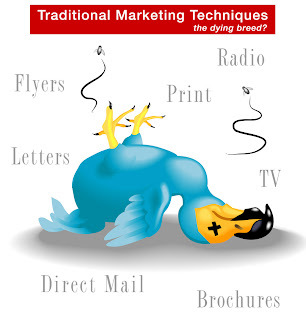 Online Marketing for businesses with big ambitions: Is Traditional Marketing Dead? I was at a recent event surrounded by a very diverse crowd of business men and women including a few branding and advertising gurus. A variety of topics were discussed but it didn’t take long before today’s blog topic was brought up. So we started to discuss why companies were sinking more and more of their marketing budgets online at the expense of the more traditional marketing techniques (a problem the TV expert in particular was finding more and more). In reality it’s fair to say we have mixed emotions about this. By taking a quick look at the statistics it’s not that difficult to see why marketing managers (and more generally business owners) are moving away from traditional techniques such as TV and print. After all, earlier this year (Feb 09) the number of worldwide internet users passed the 1 billion mark and several studies have shown that we’re more receptive to what we watch online than on TV. The problem is that statistics mask the truth and commission hungry online marketing salesmen will only tell you half the story (something we’re fighting against). What the statistics don’t tell you is that every time you enter the title of a new film, book or product into Google, there's a fair chance your awareness of that item came from something you saw on TV or read in a magazine. However, the stats are awarded to the search engine. The risk here is that companies draw inaccurate conclusions (as some have started to do) and change their marketing strategies accordingly. But for companies like Art Division it’s important to get to know a client and the offline marketing their committed to. This then allows us to maximise the potency of any online campaign(s) as offline campaigns support those online AND vice versa. As we see it, the real issue is to convert those who have yet to open up to the power of business online (and there are lots still digging their heels in). I would suggest that companies reluctant to move online will suffer the same fate as those leaving traditional marketing altogether. Twitter Lists; will your business benefit?